I was hoping to post pictures of my New Years Eve decorations this morning, but they just need a little more tweaking tonight (and by tweaking I mean my boyfriend drove me to the craft store at 9:00 last night so I could buy more glitter — he is a saint). In lieu of glittery decorations this morning, you will have to subside on a recipe I threw together for dinner this week. I think every issue of the Rachel Ray magazine has some variation of her peas and ricotta cheese pasta dish. I adapted it by tossing in some of my own ingredients, it’s simple, quick, and deliciously rewarding. Start by boiling a box of pasta of your choice (I used shells, because they trap the cheese and peas quite nicely). While the pasta is boiling, chop and brown 2-3 links of sausage in a small pan (I used sun tried tomato chicken sausage). If you’re truly talented at multi-tasking and can boil water, brown sausage, and take on an additional step… put some frozen peas in the microwave to warm them up. Next, empty half a small container of ricotta cheese into a bowl (about a cup) and toss it with some garlic powder, onion powder, salt and pepper. When the peas are warmed they can be mixed into the ricotta cheese (reserve a few to sprinkle on the top). When the sausage is fully browned, add a handful of pine nuts to the pan and let them toast for just about a minute (they burn easily, so keep them moving around the pan). Drain the pasta and reserve a dash of the pasta water (if you’re using shells you can really just quickly drain them and throw them back into the pot, they’ll hold some water naturally because of their shape). Finally, mix the ricotta and peas in with the pasta. 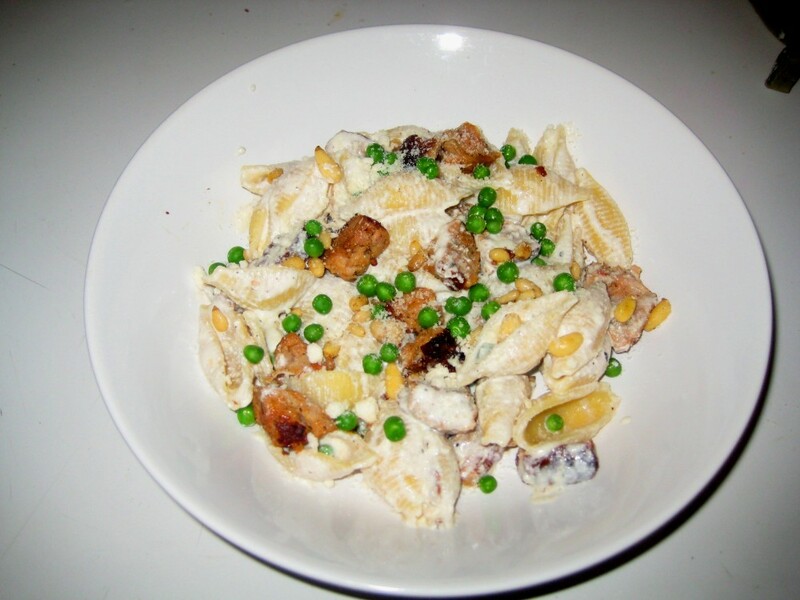 Spoon the sausage and nut mixture, and any reserved peas on top of the pasta and finish with some parmesan cheese. Eat and enjoy!